Is This A Real Prototype Jeep Pickup, Or Just A Home-Made One-Off? 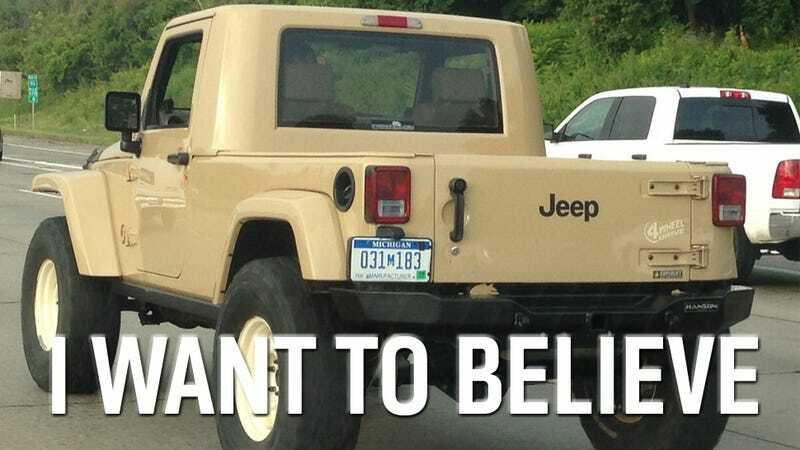 A reader spotted this single-cab Jeep Wrangler JK pickup truck with manufacturer plates in the Detroit area this morning. It's probably a product of the aftermarket, but maybe, just maybe, a Chrysler employee is field testing the very thing many of us have been dreaming of for ages: a modern, factory, Wrangler pickup. Scott Buesching of American Expedition Vehicles, purveyor of the "Brute" Jeep pickup conversion, says it's not one of theirs. He reckons it's the "JK8" bolt-on kit Chrysler showed at SEMA in 2008. But there are some differences, mainly in the roof. The JK8 kit had small rear windows on the sides, and splits in the rear glass. Not seeing that here. It's certainly possible this is just a Chrysler employee's personal vehicle with a few custom-made upgrades (the wheels are particularly suggestive of that, they're certainly not showing up at a Jeep showroom). But I think Wrangler Pickup hopefuls can glean some enthusiasm from the fact that somebody at Chrysler likes the idea of a Jeep with a cargo bed. With Land Rover threatening to attack the small-but-capable 4x4 market, Jeep just might have to innovate soon.